For more than half a century, broadcast recordings have reflected an important aspect of our culture and history. An increasing number of archivists and private collectors have restored and exchanged radio and television materials. However, despite the awareness of these primary resource materials, there is still some reluctance to utilize this aural and visual history resource. A part of this reluctance is due to the fact that little is known about the existence of many collections throughout the nation. 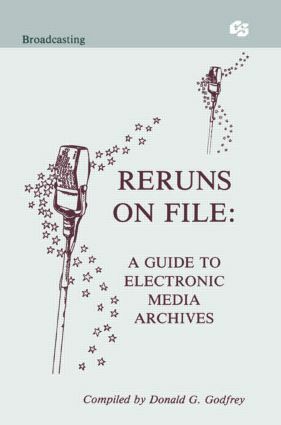 This volume provides a comprehensive directory of electronic media archives in the United States and Canada. It describes each collection, focusing on its speciality, providing the serious researcher with ready access information to these electronic media program resources. Focusing on both private and institutional collections, it is organized by state and city with indexes to provide the scholar with subject and location of specific topics of interest.